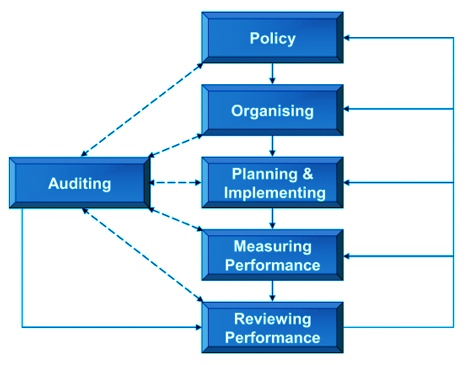 Following delivery of the OSH audit report to the client, the results of the audit are to be reviewed by the management of the workplace to determine the best course of action and to ensure that adequate remedial measures via the corrective action plan are taken. Progress made to implement remedial measures is to be monitored by management at the workplace at suitable time intervals e.g. monthly or quarterly. Section 6 (3) Occupational Safety and Health Act 2007 provides that every employer/occupier must ensure the safety, health and welfare of all persons working in his workplace and shall carrry out appropriate risk assessments in relation to the safety and health of employees. On the basis of the findings of the risk assessment process the employer shall adopt preventative and protective measures to ensure that under all chemicals, machinery, equipment, tools and processses under the control of the employer are safe and do not expose employees to harm.